Following up on recent unconfirmed reports, Kotaku has posted two “leaked” trailers — one of which reveals early gameplay footage — of LucasArts’ unconfirmed Battlefront III predecessor, Star Wars: First Assault. Both videos of Star Wars: First Assault are said to have come from a trailer that was “designed for internal use at LucasArts back in October/November” of last year. The source for the leaked trailers stated that the footage is of an older build of the game, saying “The trailer contains all in-game footage, including known bugs and incomplete art. In the time since it was made, many improvements have been made in performance, completeness, and quality.” The second gameplay trailer seems to back up this claim, as many of the character animations appear to be unfinished. 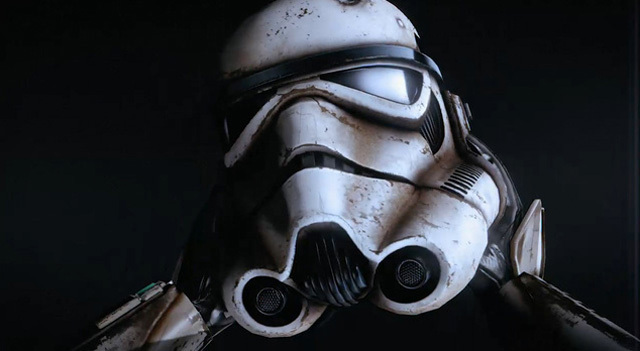 The first video is simply a sort of teaser trailer, that consists of a first-person view of a Stormtrooper putting on his helmet, before the shot cuts to the LucasArts logo. The second video is far more informative, and reveals several short gameplay segments in both first and third-person. It is unclear if the shooter is able to switch back and forth between the two perspectives, however, it appears that it is a standard first-person shooter, and the third-person footage is only shown for the purposes of the trailer. Backing up previous rumors, the gameplay shows two teams — one Stormtroopers and the other Rebels — facing off against each other on several Star Wars locals, like Bespin and Tatooine. According to Kotaku’s source, Star Wars: First Assault is a downloadable multiplayer shooter that was originally scheduled to launch sometime this Spring. The game is currently “on hold” while LucasFilm decides which projects they are going to pursue following their acquisition by Disney. Check out the two leaked trailers for Star Wars: First Assault at the source link below, and let us know your thoughts on the shooter in the comments.